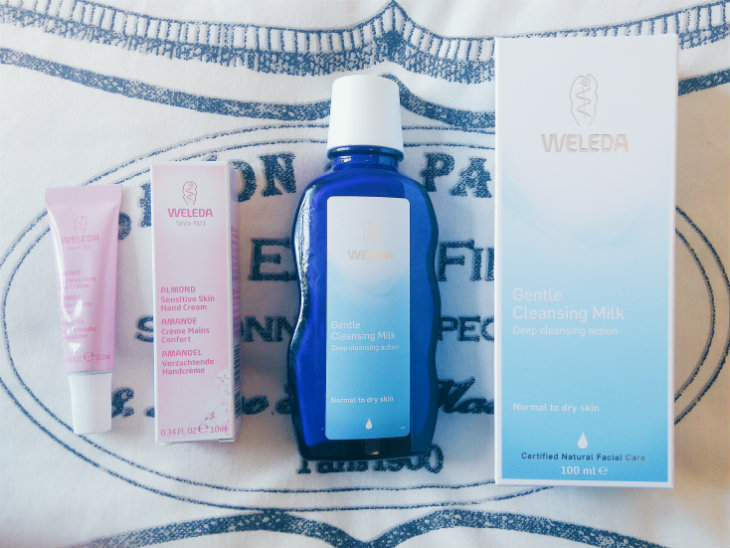 Before I started spending (a lot of) time browsing, I’d only heard of Weleda in passing and it was always the same product that was mentioned: Skin Food. They use natural ingredients where possible. None of their products contain any synthetic preservatives, fragrances or chemicals. They don’t test any of their ingredients on animals and neither do their suppliers, plus many of their products are suitable for vegans and vegetarians. They get their energy from a green energy suppler, which offers renewable energy supplies from water, wind and sunlight. Gentle Cleansing Milk contains sesame seed oil, jojoba oil, and witch hazel. It has a thin, runny formula and is always a comfort, no matter how sensitive my skin is feeling – it hasn’t caused my acne to flare up at all. You don’t need much to cover your face and it works into the skin like a dream. I like to use it in the morning and as a second cleanse in the evening. I’ll be buying another bottle when this one runs out. Speaking of bottles, the blue glass of this one is gorgeous, although I’d like it if this had a pump. It’s easy to pour out too much product otherwise, and I hate to waste something so good. I first mentioned this hand cream in my winter essentials post, praising its light, silky texture. Put simply, it’s the most luxurious, least greasy hand cream I’ve ever tried. I only own a sample-size tube, but I’ll buy the bigger version soon; I need this marzipan goodness in my life forevermore. Skin Food, because why not see if the hype is justified? I’m a sucker for a hydrating body cream and this promises to moisturise the driest skin in areas like elbows and knees. Sea Buckthorn Body Oil (v). I’ve just started using oil on my face and I love it, so why not find a body oil as well? This one is made especially for parched skin, so it’d be ideal for winter. Refining Toner (v). I’ve really got into using toners recently and I like the sound of this one; it’s fresh and mild, perfect for when you’re getting ready in the morning. Have you tried anything from Weleda? Any ideas about which brands I should investigate next? Let me know.